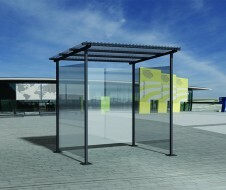 The metal smoking shelter is the centerpiece of many outdoor amenities. For a nice break in the heart of the green areas of your company, establishment or any other place. The roof and sides are made of Makrolon polycarbonate to withstand the weather and vandalism while respecting our policy of guarantees. Indeed, our model has a 10 years warranty against corrosion. It can be completed with an ashtray, a bench and litter bin (see our models of litter bins: simple or equipped with an ashtray). With its qualitative design, this product is adapted to every style.